Sir Karl Popper (1902-1994) is one of the most controversial and widely read philosophers of the 20th century. His influence has been enormous in the fields of epistemology, logic, metaphysics, methodology of science, the philosophy of physics and biology, political philosophy, and the social sciences, and his intellectual achievement has stimulated many scholars in a wide range of disciplines. These three volumes of previously unpublished essays, based on lectures given at the congress KARL POPPER 2002 held in Vienna to mark the centenary of Popper's birth, provide an up-to-date examination of many aspects of Popper's life and thought. 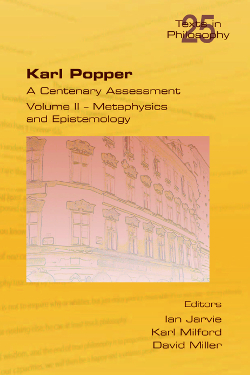 Volume II deals especially with Popper's metaphysics and epistemology, including his proposal (critical rationalism) that it is through sharp criticism rather than through the provision of justification that our knowledge progresses. Several papers tackle the problem of the empirical basis, and offer decidedly different answers to some unresolved questions. The volume contains also a number of papers evaluating Popper's celebrated, but much contested, solution to Hume's problem of induction.